Microsoft's oddly named music service put its official resignation in earlier this summer, but the Zune brand isn't in its coffin just yet -- although Redmond is certainly driving in the nails. Zune Pass subscribers, for instance, are now receiving word that the service's Mixview playback and channel playlist features will be discontinued on August 31st, along with music video streaming from the Zune desktop software. User licenses to previously purchased music videos are being reworked as well, cutting off user access to old content on new machines. The service's once heavily touted social aspect seems to be making way for Xbox Music as well: users will no longer be able to send or receive messages, invite friends or share songs, playlists, and play history. Last, but not least, the company is dealing its old hardware one final blow by discontinuing Zune HD apps -- not that there were many to kill off. 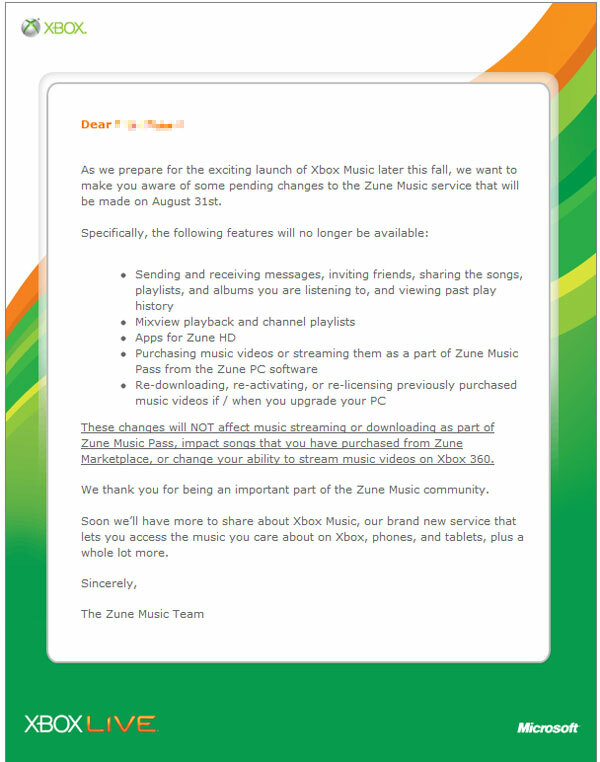 Microsoft has little else to say in the brief email, but promises to share more information about Xbox Music soon. Check it out for yourself after the break.